High Friction Surface (HFS) treatment is an innovation introduced by the State Transportation Innovation Council. It is applied to areas where motorists brake excessively, when going around curves, down steep grades, or approaching an intersection. 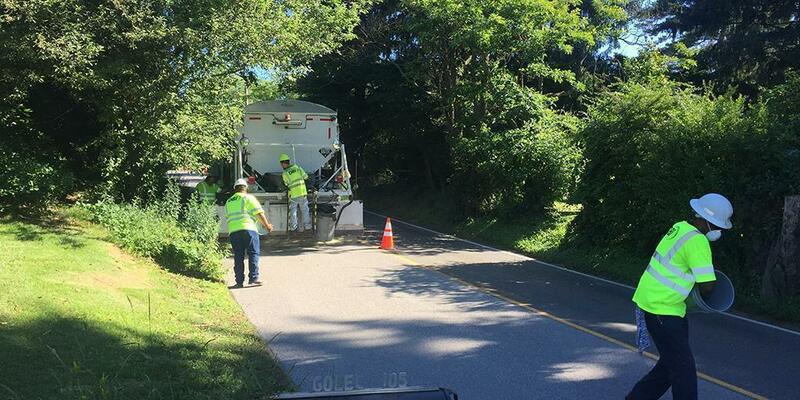 PennDOT District 10 — which covers Armstrong, Butler, Clarion, Indiana, and Jefferson counties — hosted HFS treatment events at two separate locations on Route 22 in Blairsville Borough, Indiana County, and one on Route 3018, Rowan Road, Cranberry Township, Butler County. These events provided an opportunity for local governmental officials and others to see the HFS application and discuss potential safety benefits to their municipalities. HFS uses high-quality, wear-resistant aggregates to provide increased friction on pavements. This helps vehicles on slippery pavement and reduces stopping distances. The materials used to bond the aggregates together are designed to set quickly so there is minimal impact to the traveling public. Reduces crashes, injuries, and fatalities on curves and intersections that exhibit a higher propensity for wet-pavement-related crashes. Installs quickly with minimal traffic impact. Provides a durable, long-lasting, moderate-cost surface option over the pavement’s life cycle. Increases road-surface skid resistance and water drainage. Decreases braking distance, hydroplaning, splash, and spray.